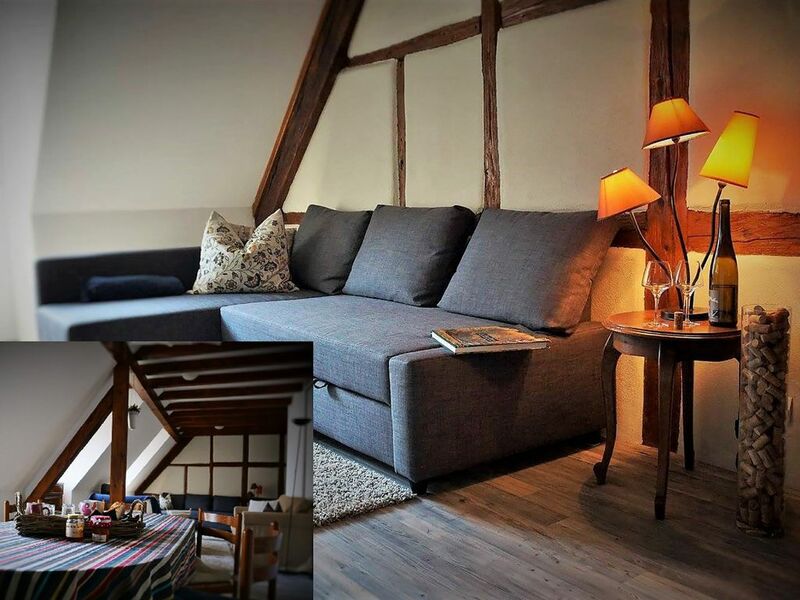 The lodging Charlotte is a lodging of 110m ² for 6 people located on the first floor, in the eaves of the wine cellar ZEYSSOLFF. It has an electric heater and individual air conditioning. Its exposed beams combined with white and taupe tones make this apartment an authentic and modern cottage. It has a small entrance with a closet. A living room with flat screen TV and DVD player, sofas and armchairs invite you to relax. A fully equipped kitchen area is at your disposal (dishwasher, washing machine and dryer, microwave, fridge-freezer, hob and oven). 2 independent rooms are composed each of 2 beds, plus 1 independent room composed of a large bed with bathroom (shower). Second bathroom with shower and toilet. Independent toilet. A dressing room of 9m². Electric heating and air conditioning included, charges and taxes included. Free WIFI. Non-smoking cottage. No pets. Sofas and armchair, flat screen TV, DVD player, mini chain, 1 large table and 6 chairs. 4 ceramic hobs, oven, microwave, fridge-freezer, dishwasher, washing machine and tumble dryer, food processor, blender, kettle, toaster, coffee maker, raclette machine and crockery. Maximum capacity (7), Linen provided, 5 bed (s) 90 x 190 cm, 1 bed 160 x 200 cms. 2 showers, 2 large single basins with cupboard, toilets in one of the bathrooms + separate toilets. Flat screen TV, TNT, DVD player, mini radio and CD channels, iron and ironing board, hair dryer and vacuum cleaner. 1 bottle of wine offered on arrival, cellar visit and free tasting during the stay. Sheets provided with 6 beds and beds made on arrival. Bath mat and kitchen towel provided. Cleaning not included in the price (80 €), optional baby kit (bath, high chair and cot) (10 € per week), Towels (1 bath towel, 1 towel and 1 washcloth) optional : 5 € the week. Extra bed and sheets on request and extra. In Barr, 2 kms away, you will also find the Restaurant du Manoir with its Alsatian dishes as well as the restaurant du Soleil. In addition to the amenities of your cottage, a lingerie common to all the cottages is free of charge, in which you will find a washing machine, a dryer, drying clothes, a table and an iron, outdoor games (bowling, snowshoeing ...) for children. Schöne Wohnung nette Vermieter !! Leider ist die Gegend ein bisschen verlassen und man brauch ein Auto selbst zum Brötchen holen. Aber gute Möglichkeit für Ausflüge nach Colmar,Strasbourg,Freiburg,Rust etc. Sehr nette Vermieter und Kellerbesichtigung und Weinprobe inklusive. Matratzen etwas gewöhnungsbedürftig, vorallem das siebte Bett. Gute Lage für Ausflüge nach Straßburg, Colmar und das restliche Elsass. Supermarkt in Laufnähe mit großer Auswahl. Ferienwohnung hat alles was man braucht und ist gemütlich eingerichtet. Auch bei unserem Besuch im Winter angenehm warm. Saubere geräumige Wohnung, alles vorhanden, was man für ein Wochenende benötigt. Nette Mitarbeiter. Mitten im Elsass.Zwischen den Weinstöcken gelegen. Guter Ausgangspunkt für alle Aktivitäten. Nette Vermieter und tolles Weingeschäft mit Führung und Weinverkostung.